Toast guajillo chiles for about 20 seconds per side over an already hot pan or comal set over medium low heat. Be careful not to burn them or they will taste bitter. Place toasted chiles, tomatoes and garlic in a pan covered with hot water and simmer for about 10 minutes until the guajillos are softened and tomatoes are cooked through. Place the chiles, tomatoes and garlic in the blender with about ½ cup of the cooking liquid, the onion, oregano, cumin and salt and puree until smooth. Strain the sauce. Heat oil in a sauce pan set over medium high heat. Once hot, pour in the sauce, careful because it will jump a bit, and simmer for about 12 to 15 minutes, or until the sauce thickens and seasons. Taste for seasoning and add more salt if needed. Once cooled down, the sauce may be refrigerated for a couple weeks. I had a similar experience to Christina (before reading this comment) that in my fine-mesh strainer almost nothing came out, so I wasn’t sure which side of the strainer I was supposed to discard. Luckily I kept it all and it turned out delicious. Thanks Pati for all your great recipes and techniques! So glad you are enjoying the recipes and techniques, James! 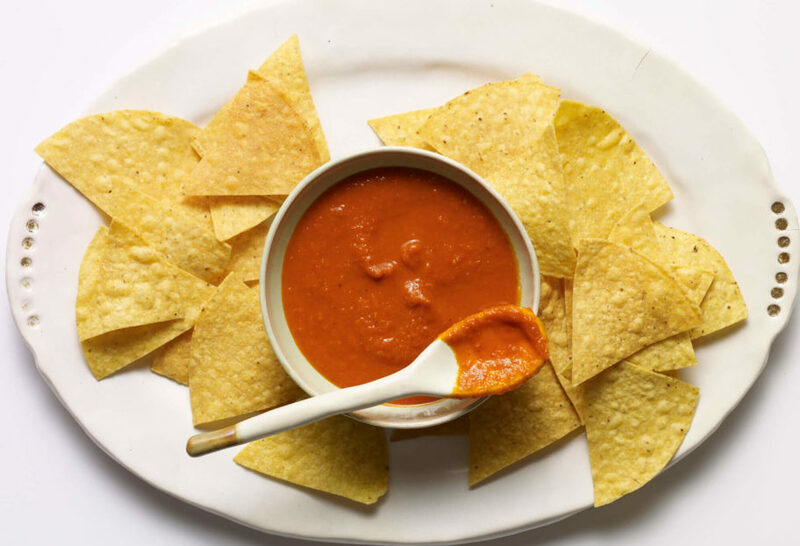 Patti, once I strained the sauce though a sieve, there was barely half a cup of salsa left. Thoughts? Regardless, it tasted delicious. Yo frio los chiles y los remojo, aparte frío los jitomates, cebolla y ajos. después muelo todo junto agreagando los chiles ya suaves y las especias.